Klukwan is a very traditional southeast Alaskan native village that has a rich cultural history and still maintains a subsistence way of life. In the old days the community members used to live in communal clan houses but were convinced by health officials during the great epidemics that swept through the village in early contact days that it would be better to live in single family dwellings. The flu epidemics combined with the culturally oppressive forces of government schools, religious teachings, and legislation created a dramatic change in the way people lived. Where there was once many clan houses with many families living in them and maintaining them, now there are only a few clan houses and nobody lives in them. Over the past 100 years many of the clan houses in Klukwan had deteriorated and were taken down because they had become a safety hazard to the community. Not living in the clan houses and suffering brought on by the culturally oppressive forces caused people to turn away from their cultural heritage and many of the clan treasures were sold and removed from the village. In the 1970’s a movement toward the culture began to take place. 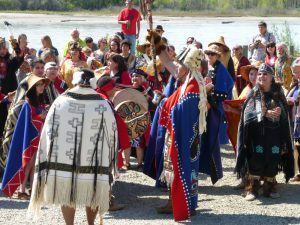 In 1976 the Chilkat Indian Village Tribal Government passed an ordinance preventing the sale or removal of clan trust property without the knowledge and approval of the tribal government. The return to the culture was slow in progressing at first but really began to pick up some momentum after the Klukwan Healing Robe was started in the fall of 1992 and the Whale House Trial was held in 1993. A plan to build the Jilkaat Kwaan Cultural Heritage Center began to take shape when the village held a strategic planning session in January of 2002. The Heritage Center is helping to addresses the village/clan’s pressing issue of where to put the precious clan treasures that are no longer housed in clan houses and the community’s desire to rebuild and restore our cultural heritage. To read more about the specific features of the building and how the building will address the goals of preserving, protecting, and perpetuating the cultural heritage of the Chilkat people please navigate to the detailed descriptions and pictures/photos of the building plans found under the heading “Image Gallery” above. For the past 10 years the JKHC has been building a network of support and collaboration. 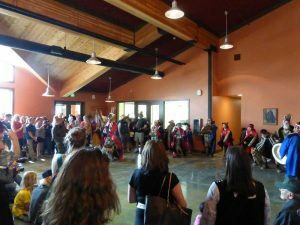 Our network includes organizations such as the Southeast Alaska Regional Health Consortium, the University of Alaska Southeast, the Alaska Humanities Forums Rose Rural Urban Exchange Program, the Alaska Mental Health Trust, the Seventh Generation Fund, the Alaska State Council on the Arts, the Chilkat Indian Village, the Klukwan Educational Trust, the Rasmuson Foundation, the Central Council of the Tlingit and Haida Indians of Alaska, Sealaska Corporation, the Chilkat Valley Community Foundation, the Klukwan School (Chatham School District), the Alaska State Museum, Sheldon Museum and Cultural Center, and the Klukwan Community Library. In addition, the JKHC and CIV have been working with the National Park Service and the Institute for Museums and Library Services to plan and prepare for the exhibits in the Heritage Center building. 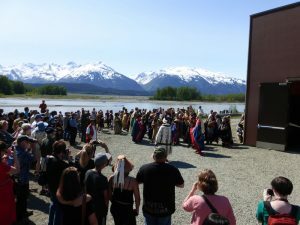 The Chilkat Indian Village is currently putting together a proposal with the National Park Service to employ a “Tribal Historic Preservation Officer” that, if successful, would broaden the scope of our building and each of these organizations have granted funds or partnered with us on various projects or programs and have enabled us to make the best use of our resources. With this network of support combined with revenues generated by our own facility through our annual fund raising efforts and other donations, door entry fees for the JKCHC exhibits, salmon camp registration fees, tour sales, gift shop sales, food service, and building space leases we are confident that we are well able to sustain the operation and maintenance of our buildings.